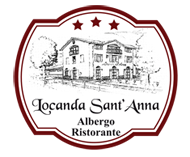 Dated from mid eight hundred, the Locanda Santanna Wine Cellar has been refurbished completely to contain, to preserve and to age at a constant temperature of 12-14 degrees, more than 3000 bottles of the best selected Italian Wine. We serve typical ham, salami and cheese with appetizers and wine tasting. More than two hundred selected labels, figure out every region of Italy and its best wine.